It’s been five years! That’s a long time to have kept up a journal, with original pieces appearing every week – usually two, each of us writing a post. It keeps us busy: 464 posts to date. We thought we should do a review of the posts which have been most popular: viewed by the most people. These are not necessarily the ones we would consider to be our own favourites: we’ll let you know what we feel our ‘finest hour’ has been next week – while you are all preparing the Christmas lunch! 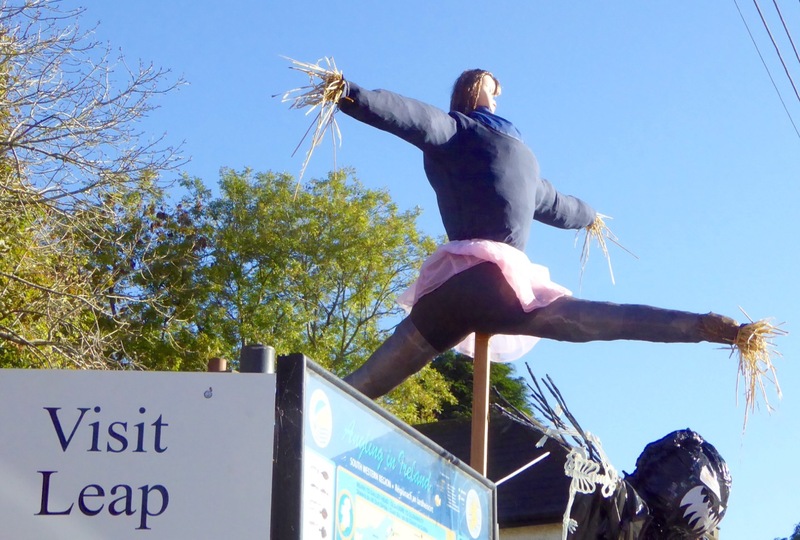 We never quite understood the all-time popularity of Beyond Leap, Beyond the Law, my post which was simply a collection of photos taken at the West Cork village’s 2015 Scarecrow Festival – with a little bit of history about the place added in. It was certainly a wonderful display of the imagination of the people of Leap. Have a look at the post: just one or two photographs don’t do it justice. Up next is Finola’s piece from 2016 – Outposts of Empire. This was a much more scholarly article, and involved a lot of research. As you must know, we never pass a church or a burial ground without a full investigation: they provide a wealth of local history. 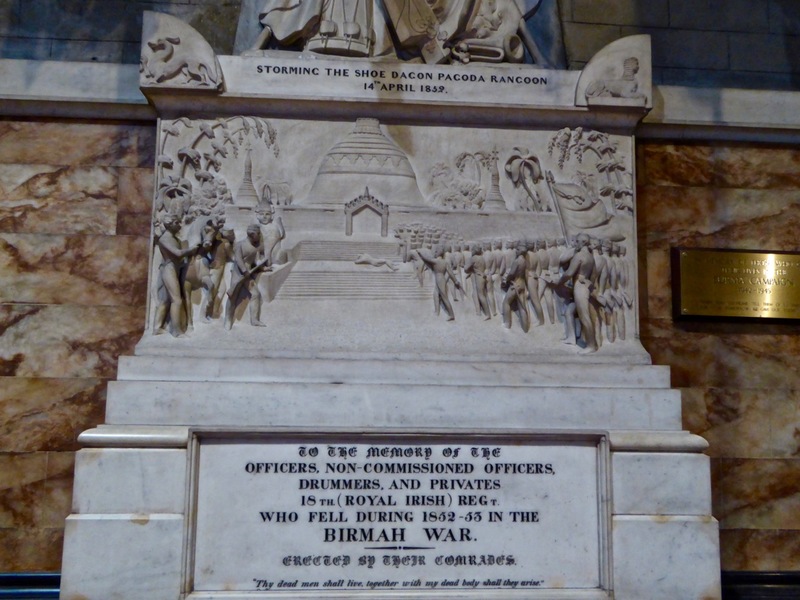 Finola became fascinated by the memorials – mainly military – which appear in Protestant churches around the country. This led her down the path of her own ancestors, many of whom served in the Irish regiments of the British forces. She found this wonderful photo from around 1900 of her Brabazon forebears. 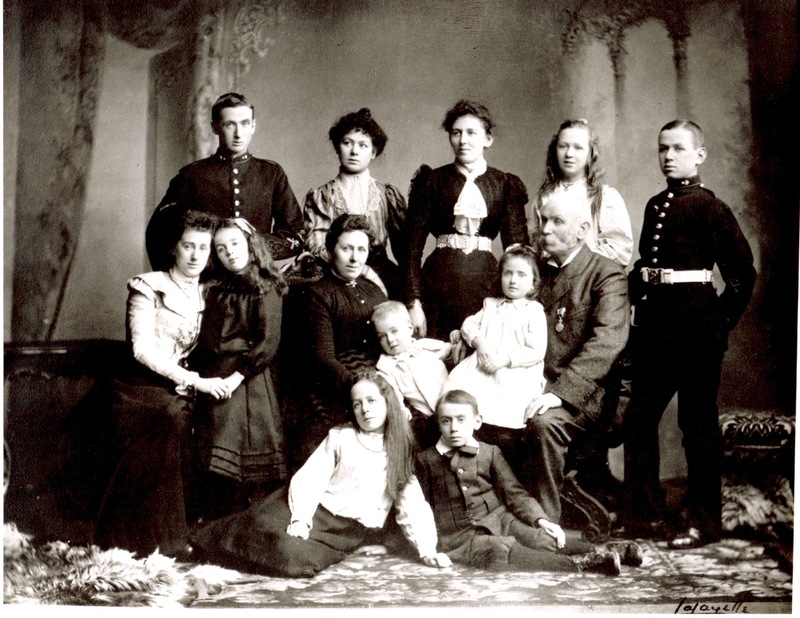 Her grandmother Marie is in the centre of the back row, while her great grandfather John Edward Brabazon, who had served in India and Afghanistan, wears a military medal. The two younger men are Finola’s great uncles Michael and James, and they are wearing the uniform of the Royal Hibernian Military School. Finola’s series on ‘how to speak like a West Cork person’ was a winner, the most popular being her fifth episode: How Are You Keeping? Here is a link to all of them. They make amusing reading, but at the same time they give a lot of insights as to how the Irish language has coloured the way English is spoken here. 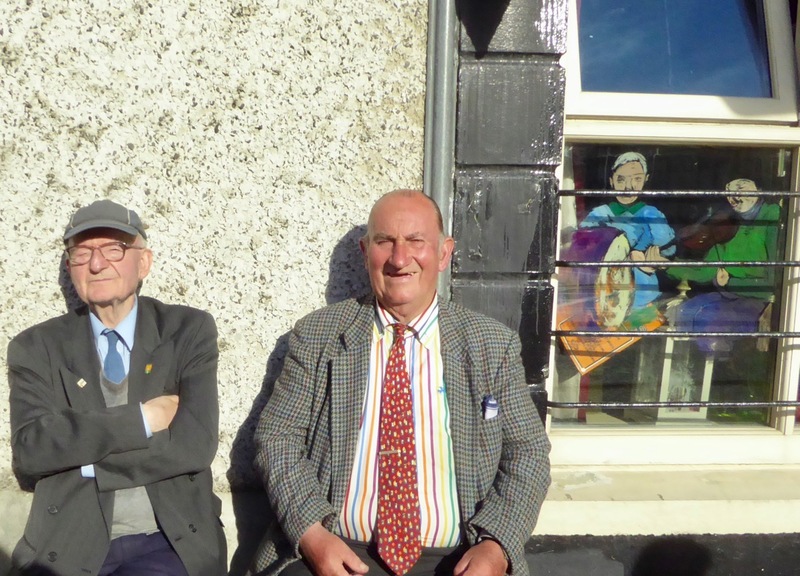 And here is Finola’s great picture from that post: two Skibbereen gentlemen who might well be asking how are you keeping? Archaeology comes next, with my account of a most eccentric decorated chambered cairn within the Boyne Valley complex: Fourknocks – the Little Giant. 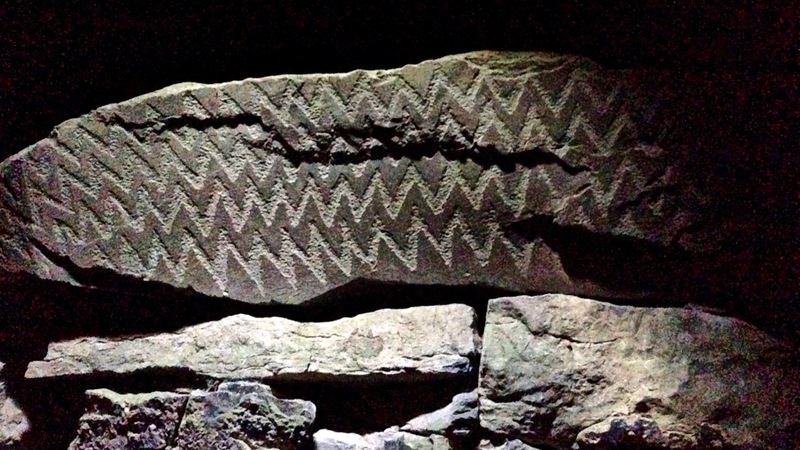 I was particularly taken with the adventure of visiting this tomb, from the first moment of having to collect the key from a farm a mile away in order to let ourselves in, to the experience of being inside with the door shut behind us: total darkness at first, but gradually becoming aware of the remarkable 5,000 year-old zigzag carvings on the rock surfaces within. I’m pleased that the fifth most popular post of all time is also the one I most enjoyed writing: Aweigh in Kerry. This was all about a very unusual piece of architecture which we found while travelling in Kerry – a house shaped like a ship, sitting in the sand dunes on the shoreline of Ballycarnahan townland, facing a most spectacular view across to Derrynane, the home of ‘Ireland’s Liberator’ Daniel O’Connell. I was an architect in a former life, and I would have welcomed a commission such as this. It was built in the early 1950s. Sixth and last in this little review is a post from Finola (happily, we had three each in this list of the top most popular posts! ): Castle Haven. 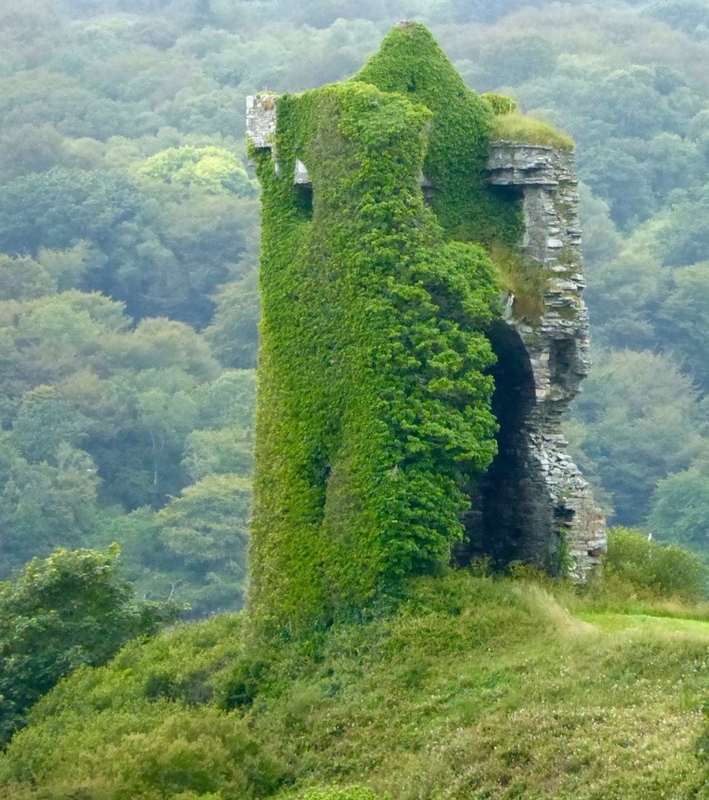 Such an account of a place in magical West Cork – which typically offers everything anyone could want in beautiful landscape, village architecture, archaeology, history, literary heritage, art and the omnipresent Atlantic coastline – is exactly what we aspired to for the foundation stone of Roaringwater Journal when we set out, in 2012 on this happy, continuing journey. That’s how people greet each other in West Cork. Lovely, isn’t it? And when we say goodbye we always add Mind yourself. Mind yourself – it’s like being told to be careful, to look after yourself, and not to forget to take time to have a cup of tea and a nice sit down occasionally, all rolled up in one. It’s been a while since I’ve written a post on how to speak like you’re Irish (scroll to the end to see a list of the previous posts) but I’ve been keeping notes all along, so here is my latest primer so that you can feel like you’re getting the hang of West Cork Speak. Besides my own images, I’m illustrating this post with cards from Conker Tree Studio. Justyna, from Poland but now living in Ireland, has designed a line of cards and magnets with directions and phrases that she has come to, er, appreciate in the everyday talk around her. Look out for her cards anywhere you go in Ireland, or buy them online. Sure can be used on its own, but it’s more usually heard in combination with other words in phrases that convey an endless variety of responses useful in almost every circumstance. Take Ah, sure, j’know – use it to express sympathy, along with an exquisite understanding of the circumstances being related. Ah, sure, look is similar although it’s pronounced with a more world-weary air and perhaps without the underlying implied slight cynicism of Ah sure j’know. The auld arthritis is killing me but isn’t it a grand day? Sure, we can’t complain. I bought it off a farmer and it runs great. But I just discovered it has no seat belts. Ah sure, what harm. I paid my water bill, like an eejit, and now I hear the lads who didn’t pay won’t get penalised. Ah sure, j’know. I was hoping to get the silage cut today but would you look at the rain, ’tis coming down in sheets. Ah sure, look. Sure, aren’t we all having a grand time? Around children, it’s good to tune in to the specialised vocabulary adults use for their behaviour. Being bold has nothing to do with bravery – to be bold is to misbehave. If a child is being annoyingly but not nastily bold, he might be just acting the maggot. Or she might be a bit giddy. In any case, the proper response of any right-thinking adult in the vicinity is to give out to them. Giving out means rebuking or reprimanding. The other thing adults like to do with children (and other adults) is to put manners on them. This is a very handy phrase that can be used in all kinds of ways. Nobody’s acting the maggot here! Sinead, stop acting the maggot. Ah, Mammy, don’t be always giving out to me. The eldest was put into Miss O’Brien’s class this year. She’s strict out – that’ll put manners on him. Perhaps because it’s considered bad form to say no (even if that’s what you mean) we have developed a plethora of ways to say yes. No bother is a universal favourite, but perfect has lately been making significant inroads. Y’know yerself, however, is the ultimate form of both eliciting and delivering concurrence. I think the clutch has gone but I need it desperately for tomorrow. No bother. I’ll have the Full Irish, but no meat, extra mushrooms, gluten-free toast, a large cappuccino…no wait, I’ve changed my mind, add the black pudding back in and change the cappuccino to a soya latte. Perfect! How are you? Ah sure, y’know yourself. So now – off you go and do a biteen of practice. You know yourself, like, that it’ll take a while before you can make a good fisht of it, like Justyna from Poland. But if you don’t get around to it, no bother. Life is busy, in fairness. Mind yerself, now. Two local lads, from Lisheen down the road, have stolen the hearts of everyone in West Cork. Everyone in Ireland, actually, and beyond. Gary and Paul O’Donovan won a silver medal in Rio in their rowing pairs class. They row for the Skibbereen Rowing Club, a local club that punches way above its weight in national and international competitions. The coach credited with that is the brilliant, but mono-syllabic, Dominic Casey. Taking Gary and Paul under his wing, he turned them into the hard-working athletes they are. Their parents’ devotion was sterling. Eoghan Harris’s Independent interview with their Mother, Trish, is perhaps one of the most revealing pieces of journalism about the O’Donovan Brothers phenomenon and what it takes to support an Olympian. Gary and Paul are also dream interviewees – every sentence is a sound bite, delivered in pure West Cork accents, with artless but articulate insouciance. Their interviews are now the stuff of legend – but if you haven’t already seen them, take a look at this one done before the final race. What shines through, and makes them so endearing, is that they take their training, but not themselves, seriously. The classic quotes have already been immortalised and the T-shirts have been selling like hot cakes in Skibbereen. The night of their homecoming it seemed like the whole of West Cork turned up to welcome them, including us! It was great fun to be there, in the streets, waiting for the open-topped bus, and then to see them on the stage, with Dominic Casey, so obviously having the time of their lives. Someone who came in for special praise in one of their interviews was the boys’ grandmother – their Nana (the first of the interviews on this page). Coming in cold and hungry from rowing, they gratefully wolfed down her home-made soup and ‘brown cake.’ Here in West Cork when we talk about a ‘cake of bread’ – what we mean is that solid round mass of white or brown home-made soda bread that is one of the staples of our diets, and that tourists have come to love. Vegetables: I used kabocha squash, onions, carrots, parsnips, potatoes and green beans, but you can use any robust vegetables that are in season. Other ingredients: 1 can organic tomatoes, tapioca starch, vegetable stock (I used Marigold Swiss Veg Bouillon, but Knorr Veg Stock Pot is also gluten-free)), fresh or dried herbs. Cut the squash in half, scoop out the seeds and roast in a hot oven for about 20 minutes. Leave to cool. Once cool, scoop out the flesh of the squash and chop roughly. Peel and roughly chop the onions, potatoes, carrots and parsnips. Top and tail the green beans and cut in half or thirds. Chop the herbs (I used parsley sage, oregano and fennel from my garden, but any combination that suits you is fine). Sweat the onions over medium heat in butter or olive oil until translucent. Over the onions, scatter about 2tbs of tapioca starch (this make it gluten-free, but if gluten is not a problem, just use flour) and stir until well mixed and starting to thicken. Pour in a can of organic tomatoes, the herbs, and a cup or two of vegetable stock. Stir until well mixed, then add all the vegetables. Bring to a boil, then turn down and simmer for at least an hour, preferably two or even three. After a bowl of this, you too can Pull Like a Dog! My very first lesson in how to speak like you’re from West Cork featured the many ways in which we use the word grand. 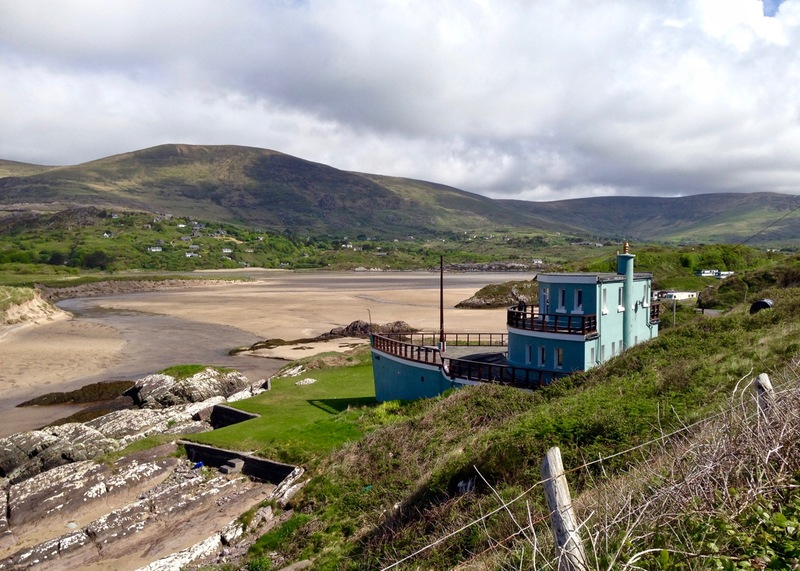 (Skip to the end to see links to previous posts on West Cork Speak.) It seems, though, that I really didn’t do it justice, as it turns out that You’re Grand is, in fact, a phrase that sums up an entire philosophy and way of life. To understand this better, I highly recommend the comedian Tara Flynn’s book You’re Grand: The Irishwoman’s Secret Guide to Life. She goes through the variations: Grand Out, Grand Altogether, Grahnd, That’s Grand, and Graaaand, so that you can use each one with confidence, and offers a lesson in connecting with your Inner Grandness. Isn’t it a grand ould bar? As you know, as a returned Irish person who spent 40 years in Canada before deciding to live in West Cork, I take very seriously my duty towards any of who you are planning to visit Ireland, to prepare you for the culture you will encounter here. First and foremost, it’s a culture of TALK, of relating to others and making them feel welcomed, helped and listened to. So what follows are the top ten essential instructions from Tara and from me that will help you understand what it is to be an Irish woman and how, at the end of the day, you’ll be Grand. 1. If you agree with something or you’re willing to at least put up with it, the proper phrase is Grand Job. 2. A most useful expression is Ah sure, feck it. You’ve just embarked on a strict diet and your friend invites you to tea and produces fresh scones. Ah sure, feck it, you might as well have one. 3. ‘Tis far from X you were reared. This will indicate to your listener that you, along with the country, has grown in incredible sophistication since the Ould Days (see 7 below). For X substitute, for example, cappuccinos, fancy cheeses, hair straighteners, salad, cell phones, avocados, skinny jeans, holidays in Thailand. 4. Try not to lose the run of yourself. In other words, don’t get carried away. You might do this by asking if they have a wine menu in a country pub, or by spending more than €10 on a handbag, or by having too many drinks and leading the singing at a session. Ah sure aren’t they only gorgeous? 6. Weddings are a fixture of Irish life (along with First Communions, which is the other time in your life when you get to wear a bridal outfit). If it’s yourself that’s getting married, Tara has one important piece of wisdom to impart: Invite EVERYONE…It’s not your day, it’s theirs. 7. Add the word OLD (pronounced ould) before nouns. Time to get th’ould hair done. Enough of your ould blather, now. Would you be after singin’ me an ould song? Come here to me now…hoooo might your people be? 9. If someone you know has bought a new car (or a house or an extra-nice new suit) the proper greeting is well wear. 10. But most of all, learn how to make a grand cup of tea. There are few things that a grand cup of tea and a little sit down won’t make better. I’ve only just skimmed the surface of Tara’s book for you. I laughed until the tears ran down my cheeks. I will leave you with an excerpt from her disquisition on salads. one really, really limp leaf of lettuce. Just the one – you wouldn’t insult people by giving them too much lettuce to deal with at such a sad time. This “salad” is the main reason why Irish vegetarians still sometimes have to explain to relatives that ham isn’t a vegetable. Irish women do eat more salad these days. But we make sure to have it with chips. For balance. Go buy the book, then curl up with a grand cupán tae, and plan your trip. West Cork Speak: Lessons 5 to 7. And PRIZES! Time for the next lesson in how to sound like you’re from West Cork! In Lessons 1 and 2 we covered like and grand, now and so – versatile words that will take you a long way in any conversation around here. Then in Lessons 3 and 4 we looked at how you would frame your sentences in the conditional tense, and how to use the pronouns ye, and himself, herself and yourself. I hope you have been practising, in preparation for your visit. You ARE coming, right? Good – well so, you would need to be moving along to the next important steps in your language development. And to help you see where you’re coming, I will illustrate these lessons with pictures of the St Patrick’s Day parade last Monday in Ballydehob. Nothing distinguishes the West Cork denizen like the phrase in fairness. Occasionally rendered as in fairness, like or even to be fair, it is tacked on to the end of sentences with total abandon, whether it matches with the sense of what’s been said or not. If you meet someone on your walk, don’t be surprised to hear him say “’Tis a grand evening, in fairness like.” It’s as if it’s important to give God His due – He’s sent us lots of storms lately and endless days of rain, but sure, He’s doing His best to make it up to us now, isn’t He? Sometimes you are left wondering about what’s not being said. If you hear “She’s a terrific dancer, in fairness,” you might wonder if there’s another part to the sentence, that has been left out – “even though she can’t sing,” maybe. But no, it’s probably just been added for some kind of emphasis, or to round out the sentence in some way. So go ahead, just drop it in here and there, and you’ll be grand. 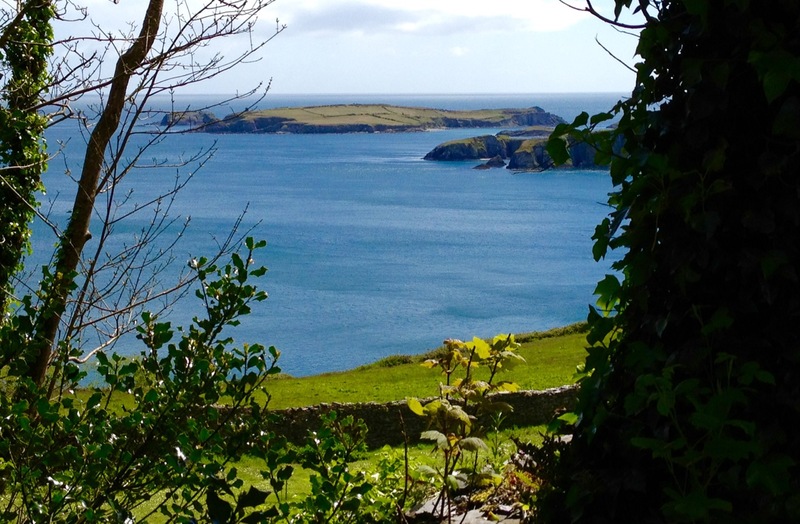 Nobody in West Cork is very happy – no, we are happy out. And why wouldn’t we be, living in this beautiful place? We might also, if we have a lot to do, be busy out. If we badly need a pint, we might be thirsty out. If using out as a modifier doesn’t trip off your tongue, try altogether instead. Or entirely. A recent story in The Examiner tells of a local hero, a student who found a toddler wandering late at night and made sure he was safe. Since the story is told mostly in dialogue, it’s an excellent example of Irish speech. Don’t they look happy out? 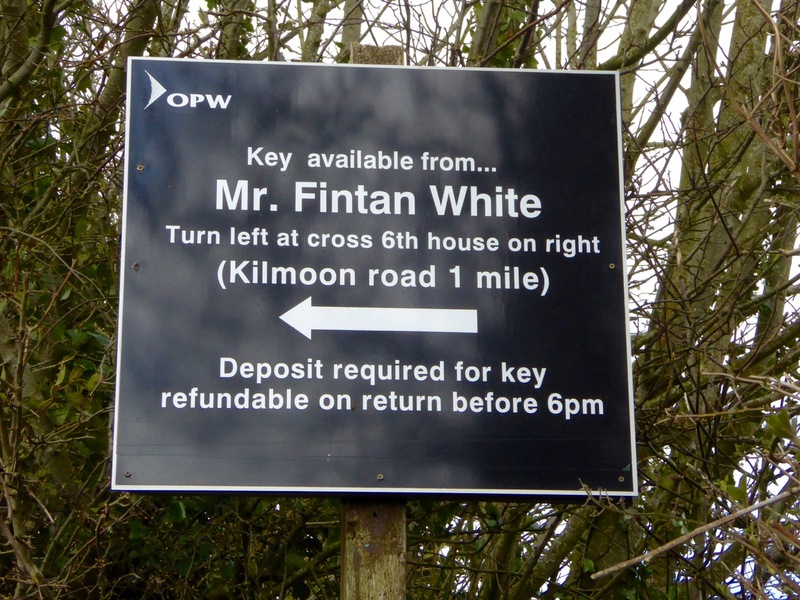 In Irish, the diminutive is formed by putting –ín (pronounced een) at the end of a word. 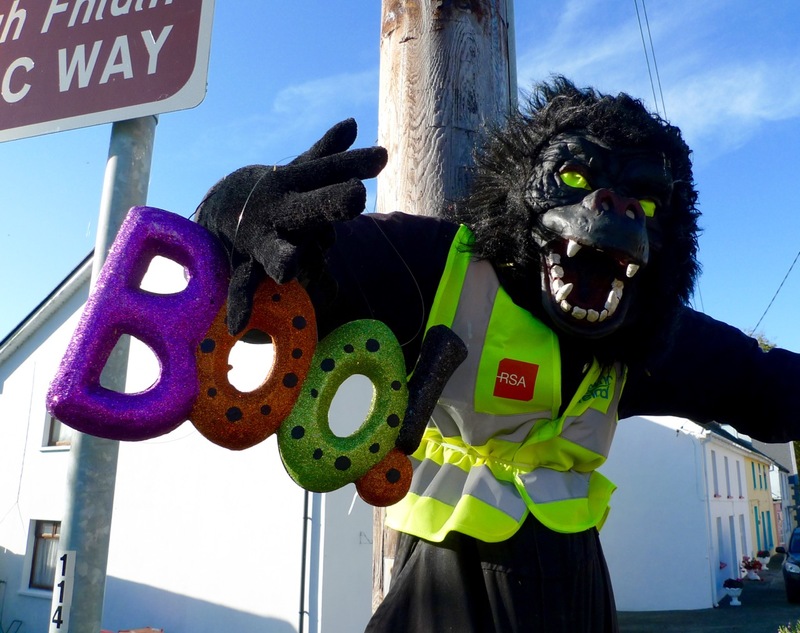 We tell people that we live down a boreen (Irish word for road is a bothar, pronounced bo-her, and a bothairín is a small road). I’ve written about the children’s graveyards here: a cillín, pronounced killeen, actually means a small cill or church. Some West Cork people routinely add -een to the end of a word to convey a sense of its size. Our landscaper asked if he should put the tools in our shedeen. Our neighbour, when I asked him about a certain piece of land said it was “nothing but a fieldeen.” You may well be asked by a waitress if you’d like a biteen more coffee. Isn’t that a grand careen? Now so – there you are! I think you might be ready to put all of that into practice. Announcing our second ever COMPETITION (the first one was about place names). Your task, Dear Reader, is to construct a short conversation between two individuals. They are driving in opposite directions, but meeting on the boreen they roll down their windows to pass the time of day. The big topic of the moment is the St Patrick’s Day parade in the village and this, therefore, is the subject of their conversation. Reconstruct the chat, using what you’ve learned in the seven lessons so far, and your own imagination. An astute panel of judge will pick the winners and excellent prizes will be dispatched. Actually, prize-eens, in fairness. Good luck!